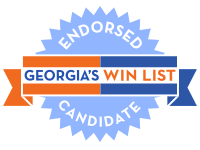 Georgia’s WIN List Endorsed Candidate for Public Service Commissioner is Lindy Miller. Lindy is a policy practitioner, local small-business owner, and active community organizer. She is also a 2013 graduate of the WIN Leadership Academy. With all of her professional and personal success, Lindy’s proudest achievement is her family. She lives with her husband and three boys less than 15 miles from where she was born and raised. Lindy started her path to success at Woodward Academy in College Park, Georgia. After graduating with her Bachelor’s Degree in Economics and Philosophy from the University of Pennsylvania, Lindy joined AmeriCorps VISTA where she served small business owners in New York recovering from the 9/11 attacks. Lindy later attended Harvard University’s John F. Kennedy School of Government to obtain her Master’s Degree in Public Administration. She began her business career at Deloitte, where she spent over 15 years working with both global and local leaders to create jobs and address complex economic policy issues. She has served on the Board of Directors for the Decatur Education Foundation, GiveWell, the Social Enterprise for Development Innovation, and the Harvard Club of Georgia. Throughout all of her professional experiences, Lindy has worked directly to improve economic development both around the world and right here in Georgia. Lindy is also the co-founder of Cherry Street Energy, a renewable energy company helping to transform Georgia’s energy marketplace. With the tagline “Do Good and Do Well,” Cherry Street Energy’s mission is to provide local, clean, and renewable energy choices to schools, small businesses, and nonprofits in Georgia. In 2016, Cherry Street Energy signed a 20-year contract with the city government of Macon, Georgia to provide solar power to its administrative building. With her decades of experience in economic policy and development, renewable energy sources, and Georgia’s own energy marketplace, Lindy is extremely qualified to represent the citizens of Georgia as Public Service Commissioner. She strongly believes that no one should have to choose between keeping the lights on or putting food on the table and that Georgia has the opportunity to unlock thousands of good jobs by investing in clean energy. Just as she does now, Lindy will tackle every issue with a level of empathy and leadership needed to ensure that Georgians aren’t limited in opportunity due to high utility bills and bad policies. Contact the Lindy Miller’s campaign below to follow the candidate’s activities more closely, make a donation, or volunteer. Georgia women like Lindy are making history in this midterm election cycle as they run for seats long held by Republicans. With women in record numbers on the ballot this year, WIN List needs your help to elect these women and train the candidates we want to see on the ballot in 2020 and beyond.